The First Annual Marketing ARC Awards celebrated the best campaigns that have embraced marketing technology solutions, and winners were announced at LeadsCon New York in August. Chief Marketer created this awards campaign in response to the explosion of tech solutions being leveraged by marketers in recent years. The marketing technology landscape is logo_marc_awards1constantly expanding and evolving, and savvy marketing teams are making the most of the tech coming their way—from marketing automation and customer data platforms, to big data and social media marketing solutions. 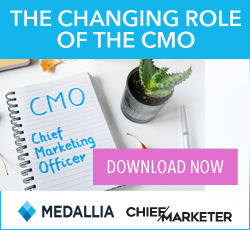 Chief Marketer created this awards program to honor the marketing teams who have embraced and are taking full advantage of the latest tech solutions in the midst of this shifting landscape. That’s why we have called the program the Marketing Adapting to Rapid Change (ARC) Awards. The winners in our 10 categories this year have created wonderfully engaging campaigns that also demonstrated measurable results—and they all have leveraged marketing technology to bring it all to life.